What Can I Learn in an Online Master’s in Nutrition Program? What Can I do with a Master’s in Nutrition Degree? How Much Can I Make with a Career in Nutrition? The field of nutrition is growing in popularity. Grass roots movements in holistic wellness that encourage people to take responsibility for their own health are partially responsible for the demand for knowledgeable nutritionists. Although a master’s degree in nutrition is not required for all careers in the field of diet and nutrition, acquiring an advanced degree provides a competitive edge in this fast-growing field and opens up new opportunities for career advancement. Several individual data points were objectively evaluated to calculate a score for each ranking factor listed above. For affordability, the most impactful data points were tuition2	and grants; for quality, graduation and acceptance rates; for flexibility, part-time enrollment options; and for program, degrees granted in that specific program area. Each score was then weighted, with affordability being the most highly weighted factor for all ACO rankings. A good master’s in nutrition online program will thoroughly prepare students for career advancement in this field. Prospective graduate students should weigh the options carefully on which online master’s in nutrition program to choose, as not all degree plans are alike. 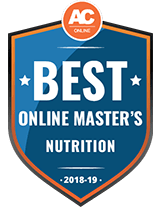 We culled information from the Department of Education, the Integrated Postsecondary Education Data System and information from the universities themselves to create our list of the best nutrition graduate programs. All schools have been accredited. North Dakota State University offers distance learners a Master of Science in Health, Nutrition and Exercise Science: Leadership in Physical Education and Sport Option. The program is designed for professionals who work in physical education and other teaching-related positions who wish to expand their skill set and offer more comprehensive instruction. Through the online Blackboard learning system, students engage with their fellow classmates and professors in chat room sessions, discussion boards and collaborative assignments. Students can complete tasks on their own timeline and work around their current employment schedules, provided they keep up with the necessary scheduled deadlines. Courses in the curriculum closely examine health-related case studies and the best modern practices for physical education instruction in K -12 and university settings. At NDSU, master's students take required courses such as Sport in American Society, Supervision and Management, Governance in Sports and Legal Liability in HPER. Prospective students should have a bachelor's degree with a 3.0 GPA or higher. NDSU prefers that incoming students have a degree in a kinesiology-related field such as physical education, coaching or sports management. Texas Tech University has an online Master of Science in Nutrition and Dietetics program. This degree is for students who are currently registered dietitians or nutritionists, are in the middle of a dietetic internship or working toward a Didactic Programs in Dietetics (DPD) verification. Texas Tech prides itself on practice-based learning with specialized elective courses such as eating disorders, geriatric nutrition and maternal health. Graduates typically move on to careers that focus on pediatrics, obesity management, diabetes and patient nutrition support. While the GRE is not required for admission, students should have an undergraduate degree with a 3.0 GPA or higher. Prospective students should also have a DPD verification statement, proof of acceptance into a dietetic internship program or have registered dietitian credentials. Applications should also include a professional resume and 2 letters of recommendation. Students in this program can apply for a variety of graduate scholarships through the Graduate School with a separate application. Scholarships range from $3,000-$5,000 a year. The University of Southern Mississippi offers a hybrid Master of Science in Nutrition and Food Systems. The majority of this degree can be completed online, but distance learners at USM enroll in an on-site dietetic internship while concurrently completing required courses. Students can choose between an emphasis in Dietetic Practice or Management of Child Nutrition Programs. For graduation, students need to finish 33-36 credit hours, including courses such as Biostatistics and Community Health, in addition to the internship and a final project or thesis. Applications must include 3 letters of recommendation, official transcripts from all universities attended, GRE scores, application fee and immunization records. Competitive applicants for USM have a 3.0 GPA or higher in their undergraduate coursework. At USM, all students pay the same tuition rate, regardless of their location, at $479.12 per credit hour. Master's students can apply for financial assistance and dietetic scholarships through the Academy of Nutrition and Dietetics Foundation and the USM Foundation. Online students can pursue a Master of Science in Nutrition and Dietetics online through the Global Campus at Central Michigan University. Students choose from three coursework options: thesis, internship or coursework. For graduation, distance learners complete 31-37 credits, at $596 per credit, in about 2 years. Required courses for this program, regardless of track, include Research Methods and Biostatistics, Macronutrients, Micronutrients and the Seminar in Nutrition. Incoming students should have a bachelor's degree from a regionally accredited institution with a minimum 3.0 GPA in the last 60 hours of coursework. Competitive applications include 3 letters of recommendation from former professors or professionals in the nutrition and dietetics field. Additionally, prospective students must submit a 2-3 page essay outlining their career goals and qualifications for the program at CMU. Incoming students may be eligible to transfer up to 15 credit hours by way of Credit by Examination or for previously earned credits at accredited colleges or universities. Distance learners in the CMU Global Campus have access to counseling services, Career Development Center resources, financial aid assistance and academic advising. Bowling Green State University offers a Master of Food and Nutrition program for distance learners. Students acquire the skills necessary to be competent health consultants in their communities and provide nutrition-based counseling and therapy for clients. The core curriculum consists of the courses Family and Community Nutrition, Micronutrients, Macronutrients and Advanced Clinical Nutrition. Degree seekers must also choose a minor concentration, with the help of their advisers, that supports their career goals. Master's students choose between completing a final project or writing a traditional thesis at the end of the program for graduation. Courses are 7 weeks in duration. In most cases, students take 1 or 2 classes at a time and complete the degree in 2 years. BGSU offers a flexible schedule with 6 starting dates per calendar year. Applications must include official transcripts, GRE scores and 3 letters of recommendation. Distance learners at BGSU have access to counseling services, resume and job support, tech support and online library access. Graduate students can also find additional networking and career planning resources through BGSU's Multicultural Initiatives for Graduate Student Success program. The University of Nebraska-Lincoln offers a Master of Science in Nutrition and Health Sciences for distance learners. Students choose between specialty areas in Community Nutrition and Health Promotion, Dietetics and Nutrition and Exercise. Nebraska students choose between 3 curriculum tracks: thesis, non-thesis and a course-heavy non-thesis, non-minor track. Degree seekers take a diverse set of practical nutrition courses including Multimedia Applications for Education and Training, Transdisciplinary Obesity Prevention, Nutritional Anthropology and Clinical Exercise Physiology. Applications should include GRE scores, 3 letters of recommendation, a personal statement of goals and a professional resume. Transfer credits may be applied toward the degree provided they are less than 10 years old. Distance students complete 30-36 credit hours, depending on the concentration, and an oral comprehensive examination for graduation. Distance learners have access to academic advising, career counseling, library resources and technical support. Nebraska subscribes to a rolling admissions policy, but students should apply by March 15 for Fall and Oct. 15 for Spring to be considered for internal funding and financial assistance. Texas Woman's University is a coeducational institution that offers a Master of Science in Nutrition. Full-time distance learners can complete this degree in as few as 18 months. Courses are offered in both fully online and hybrid formats. Students taking courses on-campus can do so in Denton or Houston. For graduation, students need to complete 36 credit hours of coursework. While no thesis is required, coursework is aligned with the same curriculum that on-campus students complete in the classroom. TWU offers an internship/master's program track for those who wish to pursue the Registered Dietician credential. Upon graduation, students are prepared to sit for the Registration Examination for Dietitians and apply for licensure in Texas. Incoming graduate students should have a bachelor's degree with a minimum 3.0 GPA. Prospective students who are interested in pursuing an internship while in this program must submit a separate application for either the Master's Dietetic Internship or School Nutrition Specialist Internship, both of which take place in Denton and Houston. TWU graduates often become researchers and developers in the food industry, educators and nutrition consultants for both private practices and marketing companies. North Carolina State University at Raleigh offers an online Master of Nutrition degree. Located in the College of Agricultural and Life Sciences, this is a non-thesis, applied degree program with available concentrations in Human Nutrition and Feed Science. This program helps young professionals pursue careers in nutrition science and related areas. Students must complete 36 credit hours of coursework, including 6 credits of a practicum, internship or approved final project. Students have a significant level of flexibility when choosing their courses in this curriculum, including both core courses and electives. Available elective courses span a wide range of topics including Exercise Nutrition; Vitamin Metabolism; Life Cycle Nutrition; Lactation, Milk, and Nutrition and Advanced Feed Formula. Prospective students should have a Bachelor of Science degree, with a minimum 3.0 GPA, in a science-related area, preferably biology or organic chemistry. Competitive applicants score at or above the 30th percentile in all categories on the GRE. Online students can take advantage of the Master of Science in Dietetics program at South Dakota State University. As part of the Great Plains Interactive Distance Education Alliance (GPIDEA), this 36-credit master's degree pools resources from 9 participating universities in the group. Students prepare for research- and clinical-based careers as nutritionists, researchers, instructors and dietitians. The program is designed for individuals who already hold the registered dietitian credential. Students may choose a thesis track, research paper track or written comprehensive exam track. All students regardless of track must complete 12 core courses and an oral defense with their supervisory committee. Graduate applications should include a resume, GRE scores, personal statement, official transcripts, contact information for references and an application fee. Incoming students should have a 3.0 GPA or higher. To be considered for scholarships through the College of Education and Human Sciences, distance leaners need to submit a scholarship application through the MyState site. Framingham State University offers a Master of Science with a Concentration in Food and Nutrition and Specialization in Food Science and Nutrition Science. Online students in this program study the technical aspects of the food industry, related engineering fields, biotechnologies and relevant health and medical concepts. Distance learners at FSU need to complete a minimum of 10 courses. Incoming students must have the proper undergraduate prerequisite courses including experience in microbiology, biology and biochemistry. Prospective students should have a bachelor's degree from a regionally accredited college or university with a minimum 3.0 GPA. Applications should include 2 letters of recommendation, a personal statement and official GRE scores. Competitive students have minimum GRE scores of 150 in verbal, 150 in math and a 4.0 in writing. Applications are accepted on a rolling admission basis, but students should plan on beginning their coursework in the fall term. Applications are due earlier than usual, by Jan. 1 of the starting year. The University of North Florida offers an online Master of Science in Nutrition and Dietetics degree. Located in the Department of Nutrition and Dietetics, online students choose from 4 concentrations: Professional Students in Dietetics Concentration, Nutritional Science Concentration, Global Health Concentration and Healthcare Informatics Concentration. Students take on a diversified curriculum and study epidemiology, nutrition education and counseling, metabolism and clinical nutrition. Students can only start classes during the fall term. Prospective students should have a bachelor's degree in nutrition, with a minimum 3.0 GPA, from an ACEND-accredited program. Applicants without a track record in nutrition science may still apply but may need to complete prerequisite coursework upon admission to the program. GRE scores, a letter of intent, official transcripts and proof of at least 3 years experience in the field are required for admission. While UNF offers an on-campus nutrition program with a built-in internship, this online program has a "non-internship" curriculum with no in-person obligations. Kansas State University offers an online Master of Science in Nutrition, Dietetics and Sensory Sciences. Located in the College of Human Ecology, this 36-credit flexible program allows students to choose from a number of electives to customize their degree. Distance learners choose from concentrations in Sensory Analysis and Consumer Behavior, Nutrition and Exercise Sciences, Nutritional Sciences, Public Health Nutrition and Nutrition Education and Communication. Mandatory courses for this degree include Graduate Seminar in Human Nutrition, Biostatistics, Statistical Methods and Regression and Analysis of Variance. Degree seekers must complete at least 30 credit hours for the master's degree. Additionally, students must choose between completing a final research project or a traditional master's thesis for graduation. Applicants must have a 3.0 GPA or higher, a GRE score of 295 or above on the verbal and quantitative sections and undergraduate coursework in pertinent areas such as human nutrition, college algebra, organic chemistry and biology. Graduates of this program move on to work in community health and wellness facilities, hospitals, nursing home facilities and non-commercial and commercial food service organizations. K-State offers an internal merit-based scholarship of $1,000 for students in this program. Regardless of the student's location, they pay $567.90 per credit hour. East Carolina University's Department of Nutrition Science offers a Master of Science in Nutrition Science degree. This program is for advanced students and those who are already registered dietitians. The curriculum prepares students for new careers in the field of nutrition science as well as career advancement. Online students can choose between a non-thesis or thesis track curriculum. Those pursuing the non-thesis option complete a final research project with the help of their graduate adviser. The thesis track requires a traditional written master's thesis based on original research in the field. Regardless of the track, students must complete courses such as Human Nutrition in Physiology and Metabolism, Biostatistics for Health Professionals and Methods in Nutrition Research. In total, students need at least 33 semester hours to graduate and are allotted 6 years to finish all requirements. Applications should include official GRE scores and transcripts, answers to the essay questions posted on the program website and 2 letters of reference. Colorado State University offers a master's degree in dietetics online. The Master of Science in Food Science and Nutrition program focuses on the practical skills needed for careers in nutrition consulting, the food service industry and nutrition-related business management. The curriculum focuses on human behavior, habits and wellness while drawing on key elements in the biomedical sciences. The program at CSU is designed for students who are already registered dietitians currently working in the field. Graduates can advance their skills and level of practice, prepare for new careers in the field or pursue doctoral study to further their education. Distance learners can finish the degree entirely online in about 2 years by completing 37 credits, including a research project. Prospective students should have a bachelor's degree from a regionally accredited institution with a 3.0 GPA or higher. In addition to submitting proof of having the registered dietitian credential, applicants must submit 3 letters of recommendation, a resume and a statement of purpose. Online students at CSU have access to academic advising, job search assistance and career training, free software downloads, technical support and veteran services. Distance learners can take advantage of Auburn University's Master of Science in Nutrition program, offered through the Department of Nutrition, Dietetics and Hospitality Management. The school offers 4 emphases: Community Nutrition, Nutrition Science, Sports Nutrition and Clinical Nutrition. Degree seekers participate in interactive online courses, including recorded lectures and collaborative homework assignments. The program is designed for advanced students who already possess some experience in the nutrition field. Learners in this program earn the credentials to advance in their current positions or seek out other career opportunities in public nutrition and health programs or work in the private sector as consultants or health advisers. This is a non-thesis degree that requires 33 credit hours for graduation. In most cases, full-time students complete the degree in less than 2 years. Distance learners pay $533 per credit hour, including fees. Applicants should have a bachelor's degree with a minimum 3.40 GPA. Additionally, applications must include their GRE scores, official transcripts, contact information for 3 letters of reference, a resume and a statement of purpose. The University of Rhode Island offers an online Master of Science in Nutrition and Food Sciences. Distance learners can specialize in 7 different areas: diet and exercise; nutritional status and food behavior of high-risk population groups; lipid metabolism; dietary behavior change to reduce chronic disease; energy and macronutrient metabolism; nutrition issues related to aging and weight management; and metabolic regulation and energy balance. Each specialization can be completed in either a thesis or project track. Both tracks require a substantial amount of research and require an oral defense of the thesis or final project. Full-time and part-time students can complete this 33-credit degree in 2 or 3 years, respectively. Applicants should have a bachelor's degree from a regionally accredited institution with a 3.0 GPA or higher. Competitive applications include a personal statement, official college transcripts, 2-3 letters of recommendation and official GRE, GMAT or MAT scores. Tuition for in-state students is $735 per credit, while out-of-state students pay $1,436. The University of Rhode Island offers scholarships for full-time graduate students in good standing. In most cases, these merit-based awards cover tuition costs and 20% of the graduate student fees. Distance learners can consult the Office of Professional Development to locate funding opportunities and receive financial aid assistance. Distance learners can pursue a Master of Science in Dietetics and Nutrition at the University of Kansas. Offered through the Great Plains Interactive Distance Education Alliance, a consortium of 8 universities, this 36-credit-hour master's degree takes 2 years to complete. Students have the option to enroll in non-thesis or thesis tracks. Those completing a thesis are required to defend an original research project or paper in-person on campus, while non-thesis students have no on-campus obligations. Only credentialed registered dietitians can apply to this program. Following the Academy of Nutrition and Dietetics recommendations for instructional criteria, this curriculum includes classes such as Principles of Statistics, Methods of Research, Advanced Macronutrients and Current Issues and Trends. This is a flexible program, with 12-15 credit hours of available electives, which helps students tailor their degree to fit their interests and career objectives. Incoming students can transfer up to 6 graduate-level courses toward the master's degree, provided they are nutrition-related and applicable to the KU curriculum. While the GRE is not required for admission, applicants should have a cumulative undergraduate 3.0 GPA or higher. Indiana University of Pennsylvania has a 100% online Master in Science in Food and Nutrition. This degree program offers 2 career-focused specialized tracks: Administration and Education. Degree seekers need 36 credit hours for graduation and choose between a thesis and non-thesis option. Professional core courses, regardless of the area of specialization, include Food and Nutrition Research Methods; Proteins, Carbohydrates and Fats; Vitamins; and Minerals and Water. Those students pursuing the non-thesis option complete 2 courses that explore research methods and research project design. Additionally, degree seekers choose 9 credits of elective courses. Popular electives at IUP include Public Health Nutrition and Epidemiology, Life Cycle Nutrition, Professional Dietetic Practice and Integrative Nutrition in Complementary and Alternative Health Care. Applications need to include an outline of one's academic goals, official transcripts, 2 letters of recommendation and a professional resume. Applicants also must possess a bachelor's degree with a minimum GPA of 3.0. The GRE is not required for admission. Stony Brook School of Medicine offers a fully online Master of Science in Nutrition program. This 36-credit degree offers concentrations in Advanced Nutrition Therapy and Critical Care, Integrative Nutrition Therapy and Sustainable Food Systems and Health. Students at Stony Brook take courses that explore statistics, metabolism, macronutrients, clinical care and practice, graduate-level research methods and forefront nutrition studies. Incoming students should have a bachelor's degree with a 3.0 GPA or higher. Applications must also include 3 letters of recommendation, official transcripts and an essay explaining why the graduate program in nutrition at Stony Brook is essential for achieving one's academic and career goals. While the GRE exam is not required for admission to the program, students should have taken prerequisite courses in physiology, statistics and introductory-level courses in nutrition or dietetics. Transfer students may receive credit for up to 6 credits of graduate coursework, provided they were taken within the last 5 years and have a grade of "C+" or better. Logan University has an online Master of Science in Nutrition and Human Performance degree. Degree seekers engage with a rigorous curriculum that explores foundational to advanced topics in diet and nutrition science, food allergies, metabolism and human lifestyle and self-care. Logan offers degree concentrations in Sports and Fitness Nutrition, Nutritional Wellness and Health Education and Promotion. Graduates of this 36- to 39-credit-hour program typically move on to careers working in education, health consulting, private practices and public health programs. This degree also qualifies graduates to sit for independent certification exams. While licensing, registration and certification requirements may vary from state to state, Logan graduates typically sit for the Certified Clinical Nutritionist exam or the Certified Sports Nutritionist exam. Applicants should have a bachelor's degree from an accredited institution with a 2.5 GPA or higher. Incoming students are expected to have completed the prerequisite coursework, including 6 semester hours of biological science and physics, kinesiology, exercise science, biomechanics or statistics. To be eligible for graduation, graduate students must maintain a 3.0 cumulative GPA throughout the program. Logan offers a variety of campus resources, clubs and organizations and career development services for distance learners and on-campus students alike. Academic success coaches and student care managers help Logan students handle the stressors of college life and get the most out of their online degrees. Eastern Michigan University offers a Master of Science in Human Nutrition degree for online students. Learners in this program study and master popular and foundational topics in current scientific research while taking courses such as Nutrition Support, Sports Nutrition, Phytonutrients, Medical Nutrition Therapy and Nutrition and Aging. Incoming students are expected to have graduate-level prerequisite courses such as Anatomy and Physiology, Biochemistry, Statistics, Human Nutrition, Metabolism and Community Nutrition and Therapy. Students can pursue the degree in 3 tracks: thesis-option, research or research writing. In total, the degree requires students to complete 30-36 credit hours and typically takes full-time students 2 years to complete. Applicants must submit a completed online graduate application, official transcripts, personal statement, 2 letters of recommendation and have a bachelor's degree from a regionally accredited institution with a 2.7 GPA or higher. Distance learners can take advantage of Eastern Michigan's counseling and psychological services, service learning and leadership opportunities, LGBTQ Resource Center and Women's Resource Center. 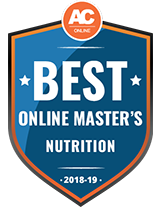 Northwestern Health Sciences University has an online degree for distance learners interested in studying nutrition at the graduate level. Its Master of Health Science in Applied Clinical Nutrition degree prepares students to be health care providers and leading wellness professionals in a growing field. Many students at NHSU complete 1 of 2 graduate certificates in Applied Clinical Nutrition which helps them further tailor their degrees to fit their career goals. Certificate tracks are available in Nutrition Intervention in Health and Disease; and Health, Wellness and Human Performance. Master's students are typically enrolled part time and take a combination of online and on-campus courses. Upon completion of the program, students have a detailed understanding of modern nutrition-related research and academic studies, develop their written and oral communication skills and prepare to take on significant patient-centered roles in the field. Competitive applicants have a 2.5 GPA or higher with a bachelor's degree from a nationally or regionally accredited university. NHSU expects students to have taken undergraduate-level courses in biology, chemistry or physiology before applying. What common courses are offered in a master’s in nutrition program? This course explores the physiological connections and relationships between the body and nutrients. This course examines the medical field and how it relates to the application of nutritional principles. This course examines the methods by which a person can enhance his or her lifestyle through nutrition. This course examines food trends and products and how they can effect change in the lives of people. This course covers the current methods of health and nutrition communication, as it applies to the public health sector. This course employs a real-life internship or practicum experience with a focus on using nutritional theory into practice. Most graduates from a master’s in nutrition program must earn their licensure with The Academy of Nutrition and Dietetics (AND) if they have not already done so when earning their bachelor’s degree. The AND is a national licensing program, but states may also require graduates sit for state licensing exams in addition to the AND exam. In addition to licensure, most nutrition graduate programs require a culminating capstone project meant to demonstrate the knowledge acquired throughout the degree program. This project may be presented in the form of original research, a grant proposal, a new nutritional program or even a nutrition-related business plan. Each school will specify the type of capstone project required, which could vary based on a student’s specialization. What specializations are available in a master’s in nutrition program? This area is based on the scientific principles of nutrition and focuses on basic skills relating to project management, interpretation of research literature, critical inquiry and problem-solving. This is a scientifically-based, functional approach to staying in good health. It addresses the causes of disease instead of trying to suppress its symptoms. Functional medicine employs natural methods of maintaining patient health with diet and nutrition. It deeply explores the biochemical and genetic individuality of each patient. A focus in this area can specialize in school nutrition, extension service, community outreach and the food industry, among other specializations. There are programs available that do not require a thesis. This area focuses on biomedical and nutritional therapy and examines how different nutritional issues affect various segments of the population. Clinical nutritionists often go on to work in either a clinical setting, or in public health or research. These professionals help patients to adopt healthy eating practices and manage diseases that result from having an incomplete diet. Some of them meet with patients at clinics and other healthcare facilities to discuss diets and other health objectives. Others work with schools, adult care facilities and other institutions to promote nutrition in their local communities. Most states required dietitians and nutritionists to carry a license. These professionals work with individuals and groups to promote healthy living in their local communities. Projects usually focus on specific elements of nutrition and diet. Health educators can usually find a job with just a bachelor’s degree, although a master’s credential will help them compete in the job market. A Certified Health Education Specialist certificate is also required for some positions. These professionals study the agricultural origins of food to improve efficiency, sustainability and overall food safety. Agricultural and food scientists work with farmers, food distributors and consumers, as well as public health agencies, nonprofit organizations and private companies. These healthcare professionals help patients with chronic injuries by teaching them to use positive exercise and fitness routines. They start by studying a patient’s medical history, and then monitor their vital signs during the treatment process to ensure they remain healthy and safe. This is a nonprofit organization dedicated to furthering the cause of nutrition. It is famous for the nutrition educational programs that it puts on and provides a venue where professionals, individuals and organizations can interact with each other. The largest organization of food and nutrition specialists in the world. It was founded in 1917 by a group of women who wanted to help the government to conserve food and improve health and nutrition for the general public. The academy now has over 100,000 credentialed practitioners and is dedicated to advancing the cause of nutrition through research, education and advocacy. This group is completely dedicated to advancing the cause, education and standards of the holistic nutrition industry. They have developed rigorous educational standards for nutrition consultants and natural chefs. Schools can apply for membership in order to be listed on their website as accredited schools. ASPEN emphasizes good nutrition as a vital part of caring for patients. It offers a plethora of resources designed to promote good nutrition among patients, and it also provides continuing education credits for its members. This popular organization provides resources for job hunters in the nutrition field. It also offers access to student information and publishes a regular newsletter. The organization is known for staying on the cutting edge in the nutrition field. There are a variety of careers in the nutrition field that may be of interest to those with a master’s degree in nutrition. Job seekers should keep in mind, however, that additional certifications and licensure may be required in addition to a master’s degree. The Bureau of Labor Statistics states that the field of nutrition is growing at a much faster rate than average, with most nutrition careers growing at a rate of 15 percent a year. While many nutrition careers only require a bachelor’s degree to start, there are two reasons why a nutritionist may choose to pursue a master’s degree in nutrition. Of course, those who have a master’s degree can generally expect to make more than someone with a bachelor’s degree. According to the Center on Education and the Workforce, those with a bachelor’s degree in nutrition sciences make a median annual salary of $52,000, while those with a master’s make $70,000. In addition to the chance of a higher salary, individuals with master’s degrees in nutrition may also find greater career opportunities. Certain organizations require nutritionists and health educators to have more than a bachelor’s degree, and earning an advanced degree helps provide an edge in a rapidly-growing field. The Accreditation Council for Education in Nutrition and Dietetics stands as the premier accrediting agency in the nutrition field. It ensures the quality of nutrition and dietetics education in order to further the profession and is valued for advancing the excellence of education that is available. ACEND assures the quality of nutrition and dietetics education through a peer review process and effectively communicates the accreditation process to educational institutions. The cost of obtaining a master’s degree is cost-prohibitive for many students. Luckily, many schools and organizations offer scholarships, grants and other forms of aid to make it easier for students to earn their master’s in nutrition degree. Professional organizations, associations and non-profit groups offer a variety of scholarships for nutrition students. CANFIT offers graduate students in California who are of an ethnic minority the chance to earn a master’s degree in nutrition. The Academy of Nutrition and Dietetics has a variety of scholarships and awards available for students. The amount of the scholarship ranges from $500 to $3,000, with many of them in the amount of $1,000. They are available for both undergraduate and graduate students. The American Mushroom Association (AMI) also has scholarships for graduate students. The American Scandinavian Foundation offers fellowships of up to $23,000 and grants of up to $5,000 for American students to go to Scandinavia for a year and pursue advanced studies, including those related to nutrition. Lasell College offers financial aid for a Master of Science in Nutrition for Human Performance. The College of Consumer and Family Sciences at Purdue University offers graduate level grants and scholarships for nutrition-related programs. Standard options such as student or personal loans can be used to pay tuition expenses. Students interested in federal financial aid can fill out a FAFSA form to determine eligibility.